Many thanks to all who attended our November meeting to see "The Pens You'd Never Sell", an old VPC theme that we decided to reuse, as many of our members found the topic of interest. 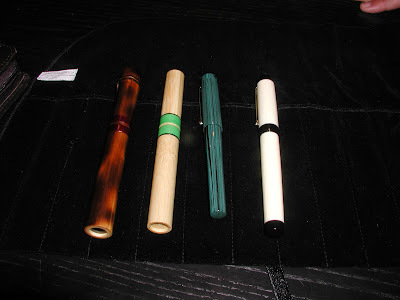 The examples seen on Thursday did not disappoint; we saw irreplaceable pens that were gifts or inheritances from close relatives, pens that were valued for their impeccable writing performance (i.e. 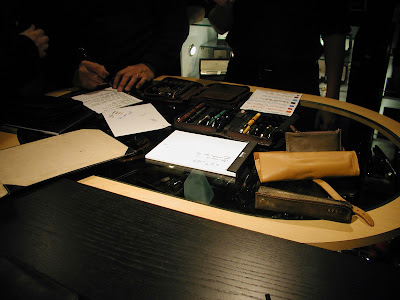 their nibs), and treasured pens that commemorated special occasions....and we got to hear the stories behind each pen (something I always enjoy). One of our longtime members, Glenn Marcus, wrote a nice piece about it on his blog here. (If you enlarge the image, you can see Graham's Pelikan M640 'Sahara' in muted yellow on one side of his 12-pen case, and his lovely Visconti Divina 'Desert Springs' fountain pen on the case's other side. Those are Glenn's hands---busy scribbling notes for his website article---on the far left of the photo). 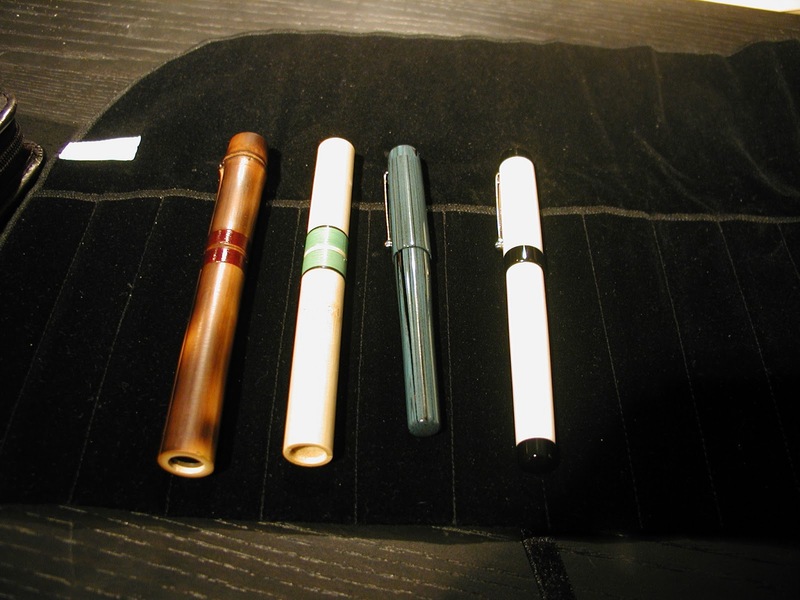 Ken's work is in high demand, so his wait time is over a year for custom commissioned pens, but he does occasionally sell non-commissioned examples on his website- Ken Cavers Custom Pens. After I posted the above, I realized I'd forgotten to mention that we had two other first-time attendees--Tim's niece Kjensmo (who lives in the U.S) and new VPC member Crispin! New members are always welcome to join our club. If you have any questions, please email me at vancouverpenclub@gmail.com ~~~~~~~~~~~~~~~~~~~~~~~~~~~~~~~~~~~~~~~~~~~~~~~~~~~~~~~~~~~~~~~~~~~~~~~ Our November meeting is the last VPC meeting for 2013, as we don't meet in December. Fear not, though - our next meeting is scheduled for Thursday January 16, 2014 at Perks pen store on Cambie Street, so I hope you can make it! Theme/topic: to be announced. It was truly a pleasure to meet so many other pen enthusiasts - I hope I can drop by again next year!